Mr. Thomas P. McDevitt, chairman, The Washington Times quoted the Times’ founder, who said: “The media should be the conscience of society.” He praised the relationship between South Korea and USA. In the next 30 years, Segye Ilbo will play a key role in the unification of the peninsula and the region. Hon. Park Byeong Seug, member and former vice-chairman of the National Assembly said that President Moon has exerted effort to establish peace on the Korean peninsula. The nuclear issue is not just for the peninsula but can be a threat to the entire world community. The conference will provide insight and broad vision in order to understand the long-range consequences of the situation in Northeast Asia. Hon. Won Yoo Chul, member, National Assembly, Republic of Korea offered congratulations to the Segye Ilbo. “It is meaningful to have this conference just before the North Korea-U.S. Vietnam Summit with President Trump and North Korean Leader Kim Jong-un on February 27, 2019. The assemblyman expressed hope that North Korea will renounce its nuclear ambitions. Hon. Stephen Harper, prime minister, (2006-2015) Canada recalled past visits to Korea, in particular, on the occasion of the Canada-Korea Free Trade Agreement signed in 2014. He expressed concern for the North’s nuclear weapons program. “We have desire for peace in our hearts,” he said, “interfaith dialogue is essential and the UPF makes a critical contribution for bringing God into the discussion.” We need to be gentle as doves but wise as serpents in dealing with the North. Kim Jong-un shows interest in economic reform but has also expressed a willingness to be violent. The Prime Minister said negotiations must be realistic and tough. “We cannot back down on the call to end their nuclear weapons and human rights violations. China has been an economic lifeline so pressure has to be put on that country. Russia is a disruptor and has maintained a campaign to undermine global norms. Canada is pleased with the progress of Korea. “This country is one of humanity’s success story from a brutally repressed country to become one of the most prosperous countries in the world.” The Prime Minister thanked UPF and all the participants for their work to bring about peace. Amb. Christopher Hill, U.S. ambassador to Korea (2004-05) thanked Dr. Hak Ja Han Moon for her vision and support, and The Washington Times and the Segye Times for hosting the program. “The division of the Korean peninsula remains the great unfinished business of the 21st century.” The Ambassador said the main objectives are: denuclearization of the Korean peninsula and support of the longstanding U.S.-South Korea alliance. President Trump treated Kim Jong-un with great respect and tried to forge a broader relationship to convince him that North Korea would benefit from a better relationship with the USA. The Ambassador said that North Korea has chosen to isolate itself. The upcoming summit represents an opportunity to create a new paradigm. North Korea should recognize that Vietnam, which experienced a prolonged war, has become one of the great successes in Asia. The ambassador said the North should not expect the United States to do anything that might weaken the US-South Korea alliance. 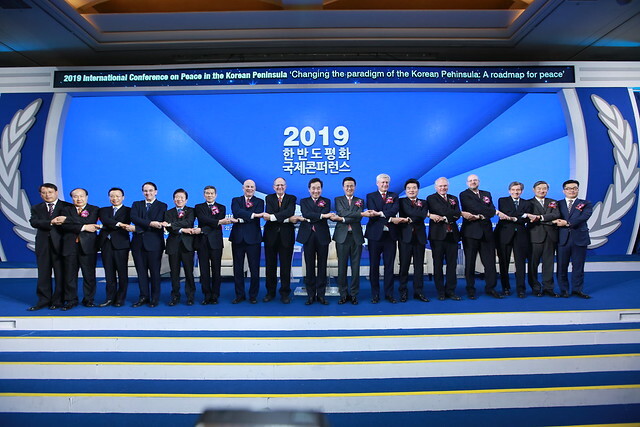 Dr. Michael Jenkins, regional chairman UPF North America served as moderator for the next session on “Denuclearization in North Korea and the Future of the Korea-U.S. Alliance.” Dr. Woo Jeong Yeop, director of Security Strategy Studies, Sejong Research Institute expressed great anticipation for the second summit between President Trump and Chairman Kim. Mr. Yeoul Soo Kim, director of Security Strategy, Korea Institute for Military Affairs spoke about the need to have a clear roadmap to denuclearization beginning with the dismantlement of the Yeongbyeon nuclear facilities and the demolishment of the ICBMs. Dr. Nam Seong Wook, professor, Reunification and Foreign Affairs Studies, Korea University; former director, National Institute of Security and Strategic Studies showed that the best scenario would be sincere denuclearization, complete sanctions relief, declaration of permanent ceasefire and peace agreement, establishment of diplomatic relations with U.S., establishment of a Washington-Pyongyang liaison office with full diplomatic ties, and lastly, a Nobel Peace Prize to Donald Trump, Kim Jong-un and Moon Jae-in. Hon. Cheon Shik Kim, deputy minister of Unification, (2011-2013), Korea, explained that “the Korean people have sought autonomous independence and international peace ever since its period of Japanese imperialism.” This basic shared value between the people of North and South Korea can be a beginning point for discussions. Session V provided a platform for the Sunhak laureates to address the 2019 peace prize theme, “Africa’s human rights and human development.” Ms. Waris Dirie, former UN Special Ambassador for the Elimination of Female Genital Mutilation, has dedicated her life to ending this procedure, which is imposed upon 98% of the women in her homeland of Somalia. Dr. Akinwumi Adesina, president, African Development Bank, recognized Mother Moon for her work to make the world a better place. Dr. Adesina spoke on the issues of global hunger and income inequality. He has been successful in convincing banks to offer micro-financing utilizing the tool that everyone has access to – a mobile phone. Session VI featured keynote addresses from former heads of state and government representing 11 nations. The moderator was Dr. Charles S. Yang, UPF regional president, Central America and the Caribbean. Speakers included: H.E. Stanislav Shushkevich, president (1991-1994), Belarus; H.E. Zivko Budimir, president (2011-2015), Bosnia and Herzegovina; H.E. Rosalia Arteaga, president (1998), Ecuador; H.E. Jocelerme Privert, president (2016-2017), Haiti; H.E. Jerry Rawlings, president (1981-2001), Ghana; and H.E. Dalia Itzik, president (2007), Israel. Other plenary speakers included: H.E. Samiu Vaipulu, deputy prime minister (2010-2014), Tonga; Rt. Hon. Sir James Mitchell, prime minister (1984-2000), Saint Vincent and the Grenadines; and Hon. Varney A. Sirleaf, minister, Ministry of Internal Affairs, Liberia. Minister Sirleaf read a message from H.E. George Weah, president of Liberia. The President reminded the participants that Liberia endured two brutal civil war (1989-1996 and 1999-2003) that left 250,000 dead and millions of people displaced. The UN responded by sending in peacekeeping troops, and today, the country is stable with a flourishing economy. The array of exceptional speakers from around the world tapped into their collective wisdom and agreed that we must challenge ourselves as leaders and to never take peace for granted. The Founders were honored at a spectacular birthday celebration at the Cheongshim Peace World Center on February 10th with dazzling entertainment, congratulatory remarks, a delicious lunch with Korean delicacies and the wonderful presence of Dr. Moon who graciously appreciated everyone’s outpouring of love and affection. World Summit 2019 concluded with an evening banquet featuring two members of parliament from Europe and South America, a government minister from Africa, and a representative from the Druze religion and UNESCO. In response to the question – where do we go from here, Dr. Walsh, UPF International chair explained there will be regional level summits leading up to World Summit 2020, in January 2020, which will feature the centenary of the Founder, Rev. Sun Myung Moon. Many participants expressed agreement that the solution to the world’s challenges should include an integrated approach incorporating UPF’s guiding principles: (1) We are one human family created by God, (2) The highest qualities of the human being are spiritual and moral in nature, (3) The family is the “school of love and peace,” (4) Living for the sake of others is the way to reconcile the divided human family, and (5) Peace comes through cooperation beyond the boundaries of ethnicity, religion and nationality.